Believe it or not, this is my high school American history textbook, which has been carted around in boxes or sitting on forgotten shelves since the mid-1980s. Whatever possessed me to read it now? 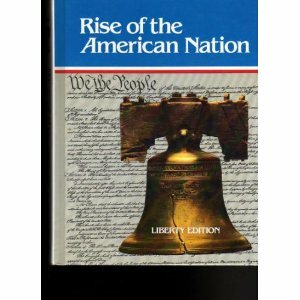 Well, I was looking for a broad, succinct and authoritative history of the United States, and this more or less fit the bill. And you know what? I really enjoyed reading it. I learned much more than I thought I would. Primarily, it seems, I learned how little I actually know about particular events and time periods in American history. What follows is a sampling of the things that seemed to leap off the page at me, demanding that I take notice of them and adjust my perception of the American nation appropriately. Maybe they are well known by everyone else and I was just sleeping in history class on the days they were taught. If so, I ask your forgiveness for my naiveté. But before I start the list, let me make two general observations. First, this experience has made clear to me how one’s view of history is tainted by their perceptions and political preferences of today. It’s a little like how the future is always imagined in the context of the present. Just as it is difficult to imagine a future fundamentally foreign from the world we live in, it’s hard to look at the past without filtering it through our modern sensibilities and political framework. And my sensibilities and political framework has changed quite a bit since I was in high school. If I had read this book this closely then, I’m sure an entirely different list of things would have jumped out at me. Reading this book has not only taught me a lot about American history, it has also helped me see how much I have changed in the last twenty-five years. And second, I couldn’t help but notice how good the book was at sticking to an honest description of the facts, and keeping from its pages any sense of slanted political commentary. Today’s textbooks (which I clearly haven’t read) are derided by some as being full of political correctness and revisionist history, but if this book is any indication, I’d have to say those accusations are pretty overblown. The authors sometimes describe what motivated opposing political sides on particular issues, but only to help the student understand why certain actions were taken at certain times. I think they did an excellent job staying above the fray and describing history as accurately as it could be in such a format for such an audience. 1. European nations clearly thought the New World was theirs for the taking. Spain and Portugal, both leaders in the new age of exploration and discovery, did not hesitate to claim all of the Americas. In 1494 they signed a treaty establishing a Line of Demarcation about 1,100 miles west of the Cape Verde Islands. According to the treaty, all new lands explored west of this line were to belong to Spain. All new lands explored to the east were to belong to Portugal. Looking at a map, it’s clear that Spain got the greater part of this bargain, but it amazes me to think that the rulers of Spain and Portugal thought they had the right to even enter into such an agreement. But they were no different than any of the other European powers at the time (and America of a few centuries later—see #9 below). King James I of England granted charters for people and companies to set up shop in the New World, supposedly under his protection and by his decree. 2. People fled to pre-colonial America to escape religious persecution in Europe. During the 1500s and 1600s, Europe was torn by religious strife that broke out shortly after Columbus’s voyages. At that time nearly everyone in Western Europe belonged to the Roman Catholic Church. The conflict began when some people began to question certain Church practices and beliefs. Martin Luther in Germany and John Calvin in Switzerland were two such people. These religious leaders and people who shared their feelings broke away from the Roman Catholic Church and established Protestant, or “protesting,” religious organizations. Roman Catholics called this movement the Protestant Revolt. Protestants called the same movement the Reformation. By whatever name, this religious conflict was not just a battle of words and ideas. Armies marched, wars were fought, and thousands of people died in battle or were burned at the stake in the name of religion. We all know this. It falls almost automatically of our tongue. But before reading this textbook, I never consciously connected the Protestant Reformation and the violence that erupted following it as an integral part of the exodus story from Europe to America. 3. Those seeking freedom to practice their religion curtailed that freedom for others when given the reins of power. Plymouth was for Separatists. Massachusetts Bay Colony was for Puritans who had not at first completely rejected the Anglican Church. Colonists who refused to accept the official religious beliefs were often thrown in jail or driven from the colony. Once exiled, they might be put to death if they returned. Such was the fate of Mary Dyer, a Quaker, who was hanged in Boston in 1660 when she returned to protest the persecution of Quakers. At first it was only Rhode Island, founded by Roger Williams, that took a different path. In Rhode Island there was no established church. Church and state—that is, the government—were separate. No one could be taxed for the support of the church. No one could be forced to attend church. No one had to belong to a church in order to vote. People could worship as they pleased and speak their minds freely. Maryland and Pennsylvania had similar practices, but both required a professed belief in “Jesus Christ,” in the case of Maryland, and in the “One Almighty God,” in Pennsylvania. Had it not been for the experiment in Rhode Island, one has to wonder if such a concept would have become part of the growing American tradition. 4. The first public schools in the English-speaking world were in Massachusetts. They were started, evidently, to insure the ability among the populace to read the English Bible. The law, passed in 1647, mandated that every town with more than 50 households would hire a teacher of reading and writing with town funds, and those with 100 households or more had to provide an actual school to prepare young men for college. Everyone, rich and poor alike, were to benefit from these expenditures. This law was the first of its kind in the English-speaking world. It was not popular everywhere in Massachusetts. Towns sometimes neglected to provide the education ordered by the law. Nevertheless, the law was a landmark in the history of education. It expressed a new and daring idea—that education of all the people was a public responsibility. 5. Even Thomas Jefferson acted unconstitutionally when he thought a higher purpose was being served. The particular instance that brought this illumination was the Embargo Act of 1807. In it, in order to reduce the number of Americans being impressed on the high seas into the English Navy, President Jefferson urged for and Congress passed a law forbidding Americans from trading with any foreign nation. Not just England. Any foreign nation. It also forbade American vessels to leave for foreign ports. After twenty years of arguing against acts of previous administrations and Congresses on the grounds that they were unconstitutional, the Father of Liberty brings about the most oppressive attack on personal freedom since the Alien and Sedition Acts of 1798. It is episodes like this that lend credence to the view that American history is one long tale of ever-increasing encroachments on the personal liberty first guaranteed under the Constitution (see #6, below). And please. I can’t help but ask. What is an “American vessel?” A ship owned by the United States? Or a ship owned by a citizen of the United States? Of course it is the latter, but the very phraseology, albeit a common convenience, lends itself directly towards the kinds of usurpations of liberty envisioned in the Embargo Act itself. Today, no one stands a chance of successfully arguing that the United States government doesn’t have the right to restrict the freedom of movement of its citizens, but back in the early days of the nation, before major precedents had been set, it may have been a worthwhile discussion to have. Is my car an “American car?” How about the computer I’m typing on. Is it an “American computer?” What rights should the government have over the possessions of its citizens? 6. It doesn’t matter which political party is in charge. The power of the Federal government always increases. In 1816, even before President Monroe was elected for the first time, the Republicans took steps to strengthen the growing nation. In so doing, they increased the powers of the federal government at the expense of states’ rights. To justify their actions, they used a loose interpretation of the Constitution, like the one favored earlier by Alexander Hamilton and the Federalists. This was one reason that the Federalist Party disappeared. By 1816 the Republicans were doing many things the Federalists had favored doing for years. This one was absolutely stunning to me. I know about Federalists like Alexander Hamilton, people who wanted a strong federal government and fought passionately for powers that were eventually NOT explicitly given to the federal government in the new Constitution. And I know about Republicans like Thomas Jefferson, people who would always see the United States as a plural noun, as a collection of free and independent states, and the Constitution as the document where those states explicitly gave only a limited number of enumerated powers to a federal government of their own creation. But I guess I never fully realized how little that dispute at the founding of our country actually mattered in the long run. 7. History has an almost creepy tendency to repeat itself. Read this and tell me what period of history it is talking about. By [year] all sections of the United States were enjoying prosperity. Conditions were so prosperous, in fact, that various groups had begun to indulge in overspecualtion. This was excessive, risky investment in land, stock, or commodities in the hope of making large profits. Southerners, tempted by rising prices for cotton, bought land at inflated prices. Western settlers, tempted by rising prices for grain and meat, also scrambled to buy land. Manufacturers in the Northeast, eager to take advantage of the general prosperity, bought land and built new mills and factories. All these groups borrowed money to finance their enterprises. Many banks encouraged the frenzy of speculation by lending money too freely on the flimsiest security. Then came the crash. Late in [year] the directors of the Bank of the United States ordered all their branch banks not to renew any personal mortgages. The directors also ordered the branch banks to present all state bank noted to the state banks for immediate payment in gold or silver or in national bank notes. State banks could not make their payments and closed their doors. Farmers and manufacturers could not renew their mortgages, and many lost their property. Astute students of history will pick up on the references to the Bank of the United States and realize that we’re talking about The Panic of 1819. But replace the “Bank of the United States” with the “Federal Reserve System” and investments in “land, stock, or commodities” with “mortgage-backed securities” and you have the story of the Great Recession of 2008. Spooky. The roots of the depression. The depression of [year] had its roots in events that occurred largely during [name]’s administration. After his election in [year], [name] had gradually withdrawn federal funds from the Bank of the United States. He then deposited this money in “pet banks,” many in western states. With the federal money as security, the “pet banks” printed large amounts of their own bank notes. Many “pet banks” were also “wildcat banks,” which issued bank notes far in excess of the federal funds on deposit. Because they were so plentiful and had so little real value, these bank notes were easy to borrow. People borrowed this “easy money,” often with a minimum of security, to buy land and to invest in the nation’s growing transportation system. For a time it seemed as though almost everyone was speculating with borrowed money. Land speculators were especially active. Between [year] and [year], yearly federal income from the sale of public land rose from about [amount] to about [amount twelve times as much]. Much of this money was in the form of “wildcat” bank notes. The United States Treasury was flooded with unsound currency. In July [year] President [name] acted to check the wave of speculation sweeping across the country by issuing the Specie Circular. This Executive Order forbade the Treasury to accept as payment for public land anything except gold and silver, known as specie, or bank notes backed by specie. The panic of [year]. Shortly after [name] issued his order, the trouble began. The sale of public land dropped off sharply because few people had gold or silver coins to pay for the land. Persons holding bank notes began to ask the banks to exchange the bank notes for the gold or silver itself. Many banks could not redeem their own bank notes. As a result, banks began to fail. By the end of May [year], soon after President [name] took office, every bank in the United States had suspended specie payment. Before the panic ended, hundreds of banks had done out of business. As the banks failed and sound money disappeared from circulation, business suffered. Factories closed. Construction work ended on buildings and roads. Thousands of workers lost their jobs. Hungry people rioted in the streets of New York and Philadelphia. President [name] and other leaders of the time did not think that the government could or should do anything to try and stop the depression. [Name] declared that “the less government interferes with private pursuits, the better for the general prosperity.” Thus he could only sit back and wait for the depression to run its course. No, this isn’t 2008, either, although it could very well be with a swap of “fractional reserve banking” for “wildcat banks.” And it’s also not 1929, although it again could very well be with a swap of “Wall Street speculation” for “land speculation.” No, the fact that banks were issuing their own notes, backed or not by their own reserves, is the clue that this is 1837 and the two presidents are Andrew Jackson and Martin Van Buren. 8. The Mexican War was a war of aggression started by the United States. They don’t teach this much in high school (at least not the high school I went to), but the evidence is right there in the textbook. There was a border dispute. Some people thought the Mexicans invaded the United States and attacked American soldiers. Others (and most historians today) thought Americans invaded Mexico and were attacked by Mexican soldiers. Either way, the Mexicans struck the first blow, and that’s probably why most people, if they know anything about it at all, think the Americans were fighting for some kind of noble cause. They weren’t. They were fighting to acquire territory that they thought they were entitled to, and which most international observers understood to be part of Mexico. 9. Americans clearly thought the world was theirs for the taking. The phrase most often used is Manifest Destiny. Its spirit is no more brilliantly illustrated than by something called the Ostend Manifesto. The ministers declared that, if Spain refused to sell Cuba to the United States, the United States would have the right to seize it by force. President Pierce disavowed this statement, but northern abolitionists were furious. They pointed out that southerners were ready to plunge the nation into war in order to add slave territory to the Union. Doesn’t that make sense? If you don’t sell me your iPad, I have the right to take it from you by force. After all, it has been ordained by God that I should possess all the iPads, from the Atlantic to the Pacific Ocean. How else can they be kept safe, and how else can I ensure that nobody is using them against me and my interests? 10. The raw politics of the day shaped every era of American history. By raw politics I mean the political maneuvering that parties do to gain and keep control of the various branches of government. Every era has them, and to try and understand why things happened without understanding the political priorities and motivations of the major players is to never fully understand what happened and why. These two paragraphs refer to the North’s plans for reconstructing the South as the Civil War began to draw to a close. Some Republicans frankly admitted that their thinking about reconstruction was influenced by practical politics. They believed that, when the war ended, white southerners would reject the wartime Republican Party and flock to the Democratic Party. Southern Democrats returning to Congress would probably support northern Democrats, thus making the Republicans a minority party. Such a combination might endanger measures supported by many Republicans—a high tariff, national banks, free land, and federal aid to railroads. The Republicans could keep the Democrats from gaining majority power in state as well as federal governments in two ways. First, they could give voting rights to the former slaves. These new voters would support the Republicans at the polls in gratitude for emancipation. Second, they could keep former Confederate leaders from voting or holding public office. Political calculation—maintaining power in Congress—was a factor in reconstruction policy, just as it is a factor in every modern issue before today’s Congress. It’s easy to remember that about the present, but someone difficult to remember that about the past. Want another example? How about the impeachment of Andrew Johnson who, whatever you think of his politics (if you even know who I’m talking about), was evidently not guilty of anything the Founders would’ve thought was an impeachable offense. But that didn’t stop his political opponents, the “Radical” Republicans who controlled Congress. To find grounds for impeachment and to reduce the President’s power, Congress in 1867 adopted the Tenure of Office Act over Johnson’s veto. Under this law the President could not dismiss important civil officers without the Senate’s consent. Believing the law unconstitutional, Johnson decided to put it to a test. In February 1868 he demanded the resignation of Secretary of War Edwin M. Stanton. Stanton has consistently cooperated with Johnson’s political enemies. Shocking, I know. Bitter menaces? How such a man ever got elected in the first place is a mystery. Under the Constitution a President may be impeached on grounds of “treason, bribery, or other high crimes and misdemeanors.” Although the charges brought by the House against President Johnson were of doubtful legality, he was nevertheless impeached. Johnson’s trial before the Senate, presided over by Chief Justice Salmon P. Chase, lasted about two months. After prolonged debate it became clear that Johnson was not guilty of any offense for which he could legally be removed from office. Nevertheless, when the Senate vote was counted, it stood 35 to 19 against Johnson, just one vote short of the necessary two-thirds majority required for removal from office. Johnson continued to serve as President for almost a year, until his term expired, but his influence was at an end. It’s another episode from history eerily reminiscent of a more current controversy. Looking back a hundred a fifty years, it’s always so simple to see the political motivations for what they are. Why do we have such a hard time when the events happen today or in our recent past? Do we somehow think that the leaders of today are above such petty motivations? Is that what people thought in Johnson’s time? 11. Industrialization profoundly changed the character of the nation. The mechanization of American life began in the early 1800s with inventions like water-powered mills, steam-powered machines and interchangeable parts, and industrialization began in the late 1800s with something they called the Industrial Revolution. In years to come, the Industrial Revolution would help unite the American people. It would help solve problems of transportation by binding the nation together with a web of steel rails. It would provide Americans with unheard-of labor-saving devices. It would profoundly affect the roles and status of both women and men in American life. It would help Americans conquer the wilderness and make use of what were then considered the inexhaustible resources of forest and sea and soil. It would in time transform the United States into the wealthiest nation on earth. Workers in so-called “company towns” faced the greatest disadvantages. There were mining districts in Pennsylvania and West Virginia and textile-mill regions in the South where companies owned entire towns—all the houses, stores, and other buildings. The companies employed the teachers and the doctors. The local magistrates and the police owed their jobs to the company. In these towns workers did not dare protest the rent they paid for their company-owned houses or the prices they paid in the company-owned store. Frequently, the workers received part of their wages not in cash but in credit at the company store. I listened to a podcast recently that talked about how our modern educational system is also a product of the Industrial Revolution, where things like standardized testing and multiple-choice questions were invented specifically to have a better and more reliable way to train children and immigrants for the life of an industrialized worker. The podcast in question argued that it was time to start rethinking some of those educational institutions because the necessary workforce of today or tomorrow is so radically different from the one that built Henry Ford’s Model Ts, but that’s not to undermine the profound effects industrialization has had on our nation. In many ways, its legacy has not yet reached its climax. 12. Industrialization led in great measure to imperialism. The Industrial Revolution was largely responsible for the mounting interest in colonies. Factories needed raw materials in ever-growing quantities. Manufacturers, to keep their factories operating, had to find new markets for their finished products. Improvements in transportation, especially the steamship, enabled businesses to buy and sell in a truly worldwide market. As trade increased and profits accumulated, business executives and bankers looked overseas for opportunities to invest savings. Swell. Except the Filipinos did not want to be uplifted or civilized (many were, in fact, already Christians). The conquest of the Philippines turned out to be more difficult that the defeat of Spain. The Filipinos, led by Emilio Aguinaldo, fought as fiercely against American rule as they had against Spanish rule. For three years 70,000 American troops fought in the islands at a cost of $175 million ($4.6 billion in 2011 dollars) and with a casualty list as high as that as the war with Spain. And when the Americans finally won, they set up a government for the Philippines with an appointed governor, a small elected assembly, an appointed upper house, and the ability of the United States Congress to veto all legislation passed. I wonder if any of that would have sounded familiar to the guys who dumped British tea into Boston Harbor in 1773. One of the things I found most surprising about this 25-year old textbook was the way it didn’t shy away from a treatment of imperialism at all. Chapter 29 is titled “American Expansion in the Caribbean; 1898-1914,” and one of its section headings is “Americans begin to build an empire in the Caribbean.” It seems true and appropriate to me, but it seems like most Americans are opposed to that kind of perspective on our history. To see it handled so matter-of-factly in print, especially in a textbook aimed at teenagers, underscored for me the explanatory power of such a reading. A big part of this was evidently a corollary Teddy Roosevelt added to the Monroe Doctrine, stating that not only would the United States act aggressively against any nation seeking to set-up colonies in the New World, but that the United States would act as a kind of police officer in any disputes between outside nations on those in the Americas. The corollary led to lots of interventions—in Puerto Rico, in Cuba, in Colombia, in Panama, in the Dominican Republic, in Haiti, in Costa Rica, in Guatemala, in the Virgin Islands, in Nicaragua—until Calvin Coolidge and Herbert Hoover eventually tried to put an end to it during their administrations. FDR, too, sought a new footing with Latin America in his Good Neighbor Policy, which supposedly said that no state had the right o interfere in the internal or external affairs of another, and that the United States was now opposed to policies of armed intervention. 13. The federal government assumes radical powers in war time. Imagine if this happened today. The President was authorized to set prices on many commodities, including such essentials as food and fuels. He was also authorized to regulate, or even take possession of, factories, mines, meat-packing houses, food processing plants, and all transportation and communication facilities. The President exercised these vast powers through a number of wartime agencies, or boards. The War Industries Board, established in [year], became the virtual dictator of manufacturing. It developed new industries needed in the war effort. It regulated business to eliminate waste and nonessential goods. Before the war’s end, the War Industries Board was engaged in regulating the production of some 30,000 commodities. Other federal agencies also took an active part in planning the war program. The War Finance Corporation loaned public funds to businesses needing aid in manufacturing war materials. The Emergency Fleet Corporation built ships faster than [enemy] submarines could destroy them. The Railroad Administration took over the operation of the railroads, reorganized the lines, and controlled rates and wages. The Fuel Administration stimulated a larger output of coal and oil and encouraged economies in their use. This wasn’t World War II. This was World War I. But it clearly presaged a lot of the government activity that took place during World War II to marshal industry for the war effort. 14. Some horrible things have more or less been erased from the public consciousness and, although true historical events, bear no real weight on the modern citizen’s understanding of his or her history. The “Bonus Army,” 17,000 strong, arrived in Washington, D.C., in June 1932. They were veterans of World War I and they called themselves the “Bonus Expeditionary Force.” Many arrived with their families. They traveled in freight cars, trucks, and wagons and on foot. They were in Washington to plead for a war bonus owed them. The money was not due until 1945, but they wanted it in advance. They were allowed to live in empty government buildings and to camp on a swampy area across the Potomac River. The army provided them with tents, cots, field kitchens, and food. When the Senate refused to grant to bones payment, most of them gave up a returned home with money provided by the government. Some 2,000 of the veterans, many of whom had no place to go, decided to stay. They were ordered to leave. In a clash with the police, several veterans and police officers were killed. Army troops then moved in with machine guns, tanks, and tear gas. The troops drove the veterans from the buildings and broke up their encampment across the river, burning the shacks as they did so. I have a hard time wrapping my head around this one. I’d never heard of it before, and this is the sum total of the information presented about it in the textbook. Imagine if 17,000 Gulf War Veterans marched on Washington today, demanded payments they had been promised to help them during times of economic depression. Imagine next that, while these veterans were camped out on the Mall, Congress voted not to support them and they were sent away. Those that didn’t leave voluntarily, some 2,000 of them, were attacked by the units of the National Guard, pepper spray and assault rifles used as needed to clear people out, and flamethrowers used to destroy the detritus they left behind. Could such a thing happen today? I would’ve have thought no, but knowing that such a thing did happen in 1932 forces me to reassess my assumptions. 15. America’s entry into World War II didn’t end the depression. It deepened it. Where did the money come from to finance the war? A little more than one third came from taxes, which were raised to the highest level in American history. The government borrowed the remainder, chiefly by selling huge issues of bonds. Because of this borrowing, the national debt shot upward from about $49 billion in 1941 to nearly $259 billion by the spring of 1945. The dollar cost of the war was staggering. By 1945, military expenditures totaled $400 billion. This was twice the sum that the federal government had spent for all of its activities, including all wars, between 1789 and 1940! Despite these [rationing] efforts, the process of consumer goods rose, especially food prices. By 1944 the cost of living had risen 30 percent above 1941 prewar levels. In July 1942 the National War Labor Board (NWLB) tried to work out a compromise. It granted a 15-percent wage increase to meet the rises in living costs. Several months later Congress and President Roosevelt authorized the NWLB to freeze the wages and salaries of all workers at the newly established levels. The most drastic means of controlling profits was the excess profits tax, levied in 1940. The tax obliged corporations to pay to the government as much as 90 percent of all excess profits. The highest taxes in American history, including a 90 percent excess profit tax on businesses. A ballooning national debt. A 30-percent increase in the cost of living with frozen wages and salaries. Exactly how did all of this get America out of the Great Depression? 16. The Bay of Pigs and the Cuban Missile Crisis were two separate incidents. All you Boomers can start razzing me now, but somehow I managed to conflate the two episodes in my admittedly poor understanding of the Kennedy administration. It’s not such much that I consciously thought they were the same thing. I just didn’t really know what the Bay of Pigs was and I must’ve just pushed it together with the Cuban Missile Crisis. The textbook has set me straight, but here’s the funny thing. Knowing how that they are separate incidents—the Bay of Pigs refers to an April 1961 CIA invasion of Cuba that was an attempt to overthrow the Castro regime and the Cuban Missile Crisis is, of course, the standoff between the Americans and the Soviet Union over nuclear missiles in Cuba in October 1962—I’m left with the conclusion that the two events were, in fact, related. Not that the textbook actually connected those dots for me. Regardless of what you think of Fidel Castro, do you suppose he was motivated to bring Soviet missiles and technology to his island nation because his giant American neighbor had tried to overthrow his government with a CIA-led invasion? 17. The Vietnam War was an unconstitutional mistake, based on a lie, that irrevocably blurred the line between right and wrong. I don’t know how else to characterize it. Especially when you read about the Gulf of Tonkin Resolution. On August 4, 1964, President Johnson appeared on television with shocking news. He announced that two American destroyers had been attacked by North Vietnamese torpedo boats in the Gulf of Tonkin. The President stated that he had therefore ordered American planes to bomb North Vietnamese torpedo bases and oil refineries. He also asked Congress to grant him authority to take action against North Vietnam. The President did not tell the nation that the American ships had been assisting South Vietnamese gunboats that were making raids on North Vietnam’s coast. He also did not inform the nation that there was some doubt whether there had been any attack on American ships at all. The House votes unanimously for the measure. The Senate passed it by a vote of 88 to 2. Senator Wayne Morse of Oregon, who voted against it, warned that “we are in effect giving the President warmaking powers in the absence of a declaration of war. I believe that to be a historic mistake. At a minimum, I believe Senator Morse was right. It was a historic mistake. One, unfortunately, that future Congresses would repeat in future situations. What I find most striking about this is that it is language from a high school history textbook, published a little more than 20 years after the fact. This isn’t some anti-war rag. This is mainstream history, boiled down to a few declarative sentences, and it all but says that the President lied and that the war was fought unconstitutionally. The Air Force poured bombs, napalm, rockets, and machine-gun fire on Viet Cong villages, hideouts, and supply routed in South Vietnam. … With support from the air, South Vietnamese and American ground forces carried out “search-and-destroy” mission against the Viet Cong. In areas they could not hold or defend, they moved the people to refugee centers and burned the villages. The Viet Cong, by the way, were not robots, but human beings, and their villages were populated by families. By the end of the war, at least 6 million people were refugees and 160,000 South Vietnamese and 922,000 Viet Cong and North Vietnamese people had been killed. Yet the textbook only uses terms like “guerilla tactics” and “terrorism” to describe the actions of the Viet Cong and the North Vietnamese. What was that I said about history repeating itself? 18. There were two energy crises in the 1970s. The energy crisis of the late 1970s is a dim memory for me (I was born in 1968). I remember the lines of automobiles at the gas station, but what I don’t remember is the energy crisis of the early 1970s, the one President Nixon tried to deal with, in part by announcing a program to make the United States independent of all foreign countries for its energy requirements by the early 1980s. How’d that work out? 19. President Reagan had virtually nothing to do with the release of the American hostages in Iran. This, too, exists as one of my earliest political memories. Somehow, I was left with the impression that after Carter’s failed negotiations and botched rescue attempt, President-elect Reagan secretly brokered a deal with the Iranians and saw the hostages released on the day he was inaugurated as President. That’s evidently not what happened. Instead the Carter Administration continued to negotiate after the failed rescue attempt, and secured the release with the Algerian government acting as a neutral arbitrator and in exchange for a payment in gold tonnage and a promise never to interfere with Iran’s internal politics again (that last bit I actually picked up from Wikipedia, not my high school textbook). Why did Iran want a promise that the U.S. would never interfere with them again? Because the reason the hostages were taken in the first place stemmed from the CIA-led overthrow of the democratically-elected Iranian government and the installation of the Shah, a dictatorial ruler, in 1953. The Shah had eventually been deposed in 1979 by an internal revolution, and he had fled to the United States for protection. The hostage takers wanted the Shah returned to Iran so he could be executed for his crimes against the Iranian people, and they took the hostages when the U.S. refused to comply.